Ex-maid of honor Eloise, having been relieved of her duties after being unceremoniously dumped by the best man via text, decides to attend the wedding anyway only to find herself seated with 5 "random" guests at the dreaded Table 19. Let me start by saying that I loved the chemistry of the whole cast together. It was the most mismatched group of people that come together to be friends. At first, of course, they didn't even know each other, but, given certain circumstances, they end up kind of forced to hang out and end up becoming friends. I loved the way Anna interacts especially with June Squibb, who plays Nanny Jo, and is one of the sweetest and funniest characters of them all. Stephen Merchant does an excellent job at playing a what the Brits call a knob head (dumb), and is the one that makes you laugh the most -believe it or not. The story of the movie is actually a cute one, centered around Anna Kendrick and Wyatt Russell (Teddy). 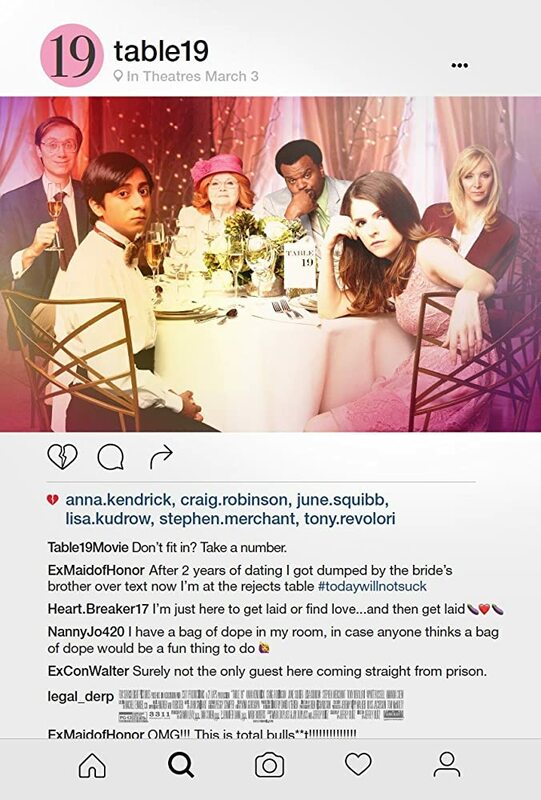 As you can see in the trailer below, Anna (Eloise) goes to her ex-boyfriend's (Teddy) sister's wedding, there she gets sent to the table of the people who are just the ones you are "forced" to invite to a wedding. Eloise is a little hostile and rude at first, but it is later explained why that is. Nanny Jo used to baby sit Teddy and his sister when they were kids, and is the sweetest ever...she's also a pot smoker and the show stealer. She is the first one that becomes empathetic towards Eloise, as well as the others, like a good grandmother. This is how the whole story really starts developing. I do want to add that the story line is actually a believable plot. There isn't much more I can say without ruining the whole movie, so I will leave you with this: if you need a laugh and a cute movie to lift your spirits, then this is the movie for you. If you are more into drama or serious kind of movies, then this definitely isn't for you. It's a chick flick with more humor than your average chick flick, with lots of great actors who really did a great job.